The U.S. currently has about 2,000 troops in eastern and northern Syria and is expected to withdraw hundreds of them in the coming months. About 200 U.S. troops will remain in Syria for the foreseeable future, a reversal of White House plans for a full withdrawal from the war-torn country, after lawmakers voiced concerns about the security ramifications of a hasty retreat. The meeting in Damascus illustrates the strong alliance between Iran, Iraq and Syria at a time when the U.S. is seeking to isolate and increase sanctions against Iran and its regional allies. Tehran has sent troops and Iran-backed fighters into Syria and Iraq to fight alongside government forces against Islamic militants, including the Islamic State group, which is on the verge of defeat by U.S.-backed Kurdish-led fighters in the last area under its control in eastern Syria. "The Americans will leave Syria as they left other places, because this is an illegitimate presence and is rejected no matter what the justifications are," Ayoub said. "Syria has affirmed the necessity of the withdrawal of these forces. It is a force of occupation and violates the country's sovereignty," he said. After years of setbacks, Syrian government forces have been on the offensive since 2016 and have regained control of wide parts of the country thanks to Russian and Iranian support. Ayoub vowed to eventually capture the last major rebel stronghold in the northwestern province of Idlib. The Russian military has commissioned more than 1,000 new aircraft and thousands of tanks in the past few years in a massive modernization effort amid tensions with the West, the nation’s defense minister said Monday. 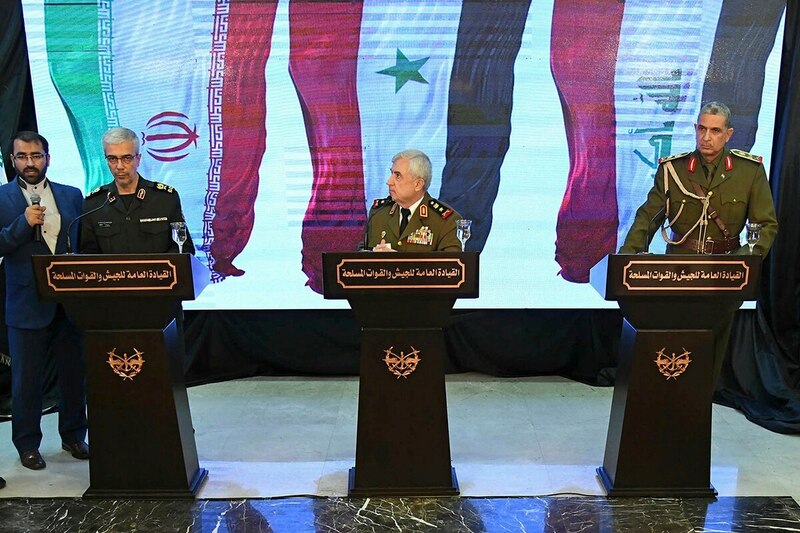 Asked about reports of tension between Iranians and Russians in Syria, Ayoub strongly denied them, saying "the role of the friends and allies was important in all that has been achieved on the ground." Iranian army commander Maj. Gen. Mohammad Hossein Bagheri, who arrived in Damascus on Sunday, said "Syria and Iraq have asked the Islamic Republic of Iran and the Iranian armed forces to stand by their side and help, through advisers as well as logistical support." He added that Iranian troops had been invited by Syrian authorities and would only leave when asked by the Syrians. Iran's official IRNA news agency quoted Bagheri as saying that Iran, Syria and Iraq will work together to bring end to the presence of foreign forces in Syria. "The current phase has aimed at reinstating the national sovereignty and territorial integrity of Syria as well as the departure of all forces who have been present in the country without permission" from Damascus, he said. Syrian President Bashar Assad threatened to attack a region held by U.S.-backed Kurdish fighters in northeastern Syria, saying in an interview broadcast on Russia Today channel on Thursday that American troops should leave the country. Bagheri added that the three countries will "continue the path" of cooperation, as they have in recent years. The Iraqi army commander, Gen. Osman Ghanemi, did not give further details about the border crossing between Syria and Iraq, saying only that it is open in the coming days.